Fewer than 3000 students are enrolled in Indian language course offerings at U.S. colleges and universities. A survey on foreign language enrollments at U.S. colleges in 2002 by the Modern Language Association found that Hindi was the most popular Indian language at U.S. colleges, accounting for roughly half of total enrollment in Indian languages. Spanish is by far the most popular foreign language among U.S. college students, accounting for well over half of the total enrollment of 1.4 million in language courses throughout the country. It was followed distantly by French, German and Italian. Among Asian languages, Japanese attracted 52,000 students; Chinese 34,000; Korean 5,211 and Vietnamese 2,236. Hindi ranked 22nd in popularity with 1,400 students. Among Indian languages, Hindi was followed by Sanskrit, Urdu, Bengali and Tamil. After 9/11, the U.S. Department of Defense and the Department of Education have launched initiatives to encourage foreign language instruction of Less Commonly Taught Languages (LCTLs) in the United States. A report by researchers at North Carolina State University on South Asian language instruction identified 84 Indian languages for the initiative, including 25 it rated at the highest priority “Category One” level. Of these only 17 were taught at U.S. universities. 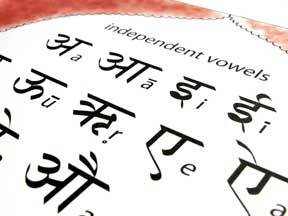 It is estimated that 75 U.S. colleges and universities offer Indian languages. Source: David Gilmartin, Dwight Stephens and John Caldwell, “Setting Priorities for South Asian Languages,” National Planning for the Teaching of the Less Commonly Taught Languages, North Carolina State University, June 2005. Source: Elizabeth B. Welles, “Foreign Language Enrollments in the United States Institutions of Higher Education, Fall 2002,” ADFL Bulletin, Winter-Spring 2004.